Last night, I had the pleasure of attending a 6 course dinner prepared by Aran Goyoaga, author of Small Plates & Sweet Treats and creator of the award-winning blog canelle et vanille. Aran Goyoaga was a pastry chef at the Ritz Carlton before she and her children learned they had to eat gluten-free. You can imagine the change was difficult considering her profession however, she has now done an amazing job through her blog and this book, showing so many of us how gluten-free foods can be both stunningly gorgeous and delicious. 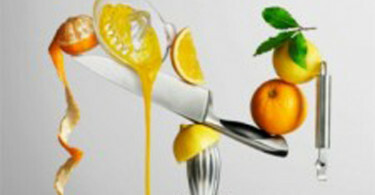 She has arranged the recipes in her book by season so you can learn what is fresh and ready to eat throughout the year. It was a lovely meal and at the end, she came around to chat and sign books. One of my favorite courses was the Roasted Cauliflower & Leek Soup with Dandelion Greens and Hazelnut Pesto. It was amazing! 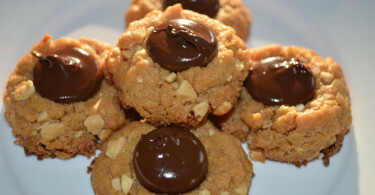 I can’t recreate the exact recipe at home since my children have tree nut allergies but I am sure I will be adapting it for us soon. In the meantime, I will share a soup recipe I learned in culinary school this week, Cream of Broccoli. 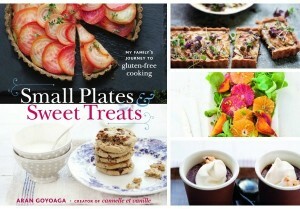 I also am going to give you the opportunity to receive a copy of the book, Small Plates & Sweet Treats signed by Aran Goyoaga! All you have to do is comment on this post by Thursday, January 17th. I would love it if you included your favorite soup to eat on a cold winter day. 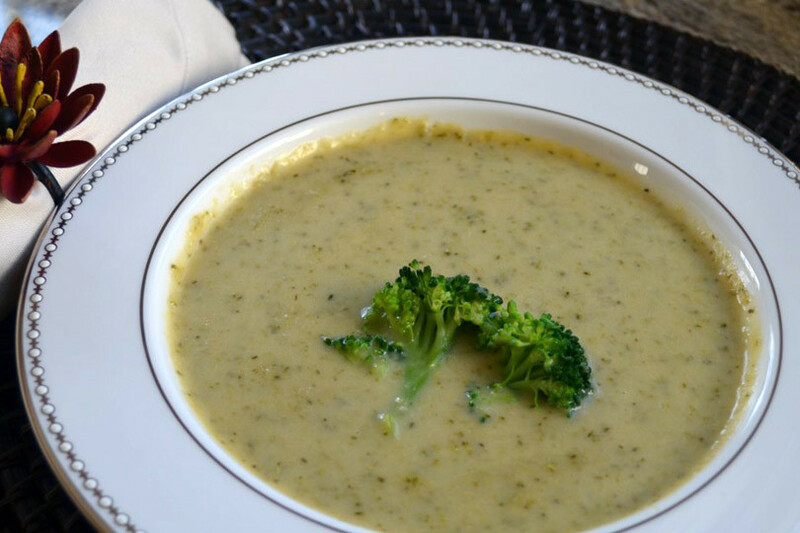 The cream of broccoli soup pictured above is a gluten-free version of the recipe we made. My head chef actually gave me the opportunity to try to make a gluten-free batch in class but the Bob’s Red Mill Gluten-Free AP Flour Blend I brought in to use completely gummed up and did not work at all. I’m not sure why. It may be that blend is more suitable for baked goods. I was a little frustrated but decided to come home and try with King Arthur’s Gluten-Free Multipurpose Flour and the soup was delicious. You would never even know it was gluten-free! Enjoy and don’t forget to comment on this post so you can receive a signed copy of Aran Goyoaga’s beautiful book! In one pot, melt ¼ stick butter over medium-low heat, add the cut up broccoli stems, diced onion and leek and allow to sweat for about 10 minutes, stirring occasionally (let them slightly cook and release aromatics but do not brown them). In the 3rd pot, combine ½ stick butter and flour whisking continuously, to create a roux (this will be your thickener for the soup). Once the roux is combined and there are no lumps, you should add in a couple of ladles of the stock and whisk it in to temper the roux. This prevents the roux from becoming clumpy. Once you've combined it with some stock and it is more of a liquid, you can pour it into the rest of the chicken stock. Add the sweated broccoli stems, onion and leaks into the stock to cook. Cook until broccoli stems become fork-tender and then add in ¾ of the florets to cook for a few more minutes. Cook the remaining broccoli in a covered bowl in the microwave on high heat with few tablespoons of water for about 3-4 mins. Reserve for garnish. Strain out the vegetables and reserve the soup. Heat the heavy cream in another saucepan. Place the cooked broccoli, onions and leaks into a food processor and puree them until smooth. Add the pureed vegetables back into the soup, pour and mix in the heavy cream and season with salt and pepper to taste. Garnish with steamed broccoli, serve and enjoy. To enter this book giveaway, you only have to leave a comment below between today, January 11th and Thursday, January 17th, midnight (EST). It’s not required but if you’d like to share your favorite soup with me, I would love it. One winner will be selected at random, there is only one entry per person, the prize must be shipped within the United States, and must be claimed within 72 hours or another winner will be selected. My favorite soup? Creamy and hearty soups. Mushroom. Potato. Split pea. Good comfort food! All sound good to me too! Thanks! This recipe sounds delicious – can’t wait to try it! Thank you for sharing! Curious as to why the Bob’s Gluten-free AP did not work. I have not bought King Arthur’s yet. I guess it’s about time! Thanks for the recipe….sounds delish! Hi! I’m not exactly sure however I think it is the types of flours that make up the Bob’s Red Mill Blend including Garbanzo, Sorghum and Fava Bean flours. It just turned into a paste right away and was not salvageable. However, I love Bob’s Red Mill flours and use them to make my own flour blend which includes rice flour, tapioca starch, potato flour and xanthan gum. The King Arthur’s blend is more similar to my homemade blend and usually works in recipes like this for me. My favorite soup is Thai Hot and Sour (sometimes called Tom Yum) soup with no coconut milk (allergic to that, too). Sounds delish. Just looked up a recipe and found one that doesn’t have coconut milk in it. I think I will try it soon http://allrecipes.com/recipe/thai-hot-and-sour-soup/ Thanks! This looks great! I hope that I win this cookbook…but I am really looking frwd to getting an autographed copy of your first cookbook! Hurry up and write one! And…favorite winter soup…french onion with melted gruyere cheese! Lauren, you are too sweet and your soup sounds delish! My old favorit is chicken and rice. Even when sick I make it home-made, and gf. Love Swanson’s broth, but Progresso’s Tuscan broth is outstanding to have in this basic soup, then I add a little garlic, carrots, celery, cooked rice (usally a jamine) and pre-cooked chicken. I wanted to try cooking school, however my allergy to wheat is so severe that I can’t inhale any gluten particles or I immediately lose my voice, and have had a very bad astma reaction. Not fun, I don’t even think of going into a bakery or pizza parlor. I am loving your recipes! Good luck on the test! Thank you so much! I’m sorry to hear how severe your allergy is but I’m glad you will get to experience a little bit of culinary school through my eyes and I really appreciate your support! Looks yummy but wish it was also dairy-free! Your broccoli soup looks great! Can’t wait to try it! My favorite winter warmers? Butternut squash or good ole chicken noodle! My favorite soup and one I always make is lentil. Something about a bowl of warm hearty lentil soup always makes me feel better your broccoli soup looks amazing (so does the cookbook)! Thanks! I love lentil soup too! Do you have a recipe for yours? If so, do share! We have so many allergies to contend with we can sometimes feel limited by the same dishes, but soup always tastes different depending on what you throw in the pot! We love to put white beans, ham, potato, leeks and kale in with chicken stock – mmm! I totally agree! Love it! Mmmm I love broccoli soups and do a good vegan version but my all time fave is a hearty root veggie/borscht with lots of dill and a hardboiled egg. Now if only I could figure out GF perogies on the side….